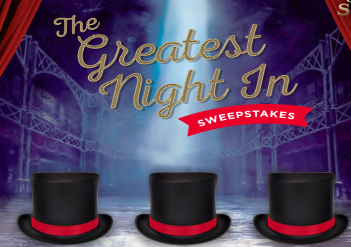 Popcorn, Indiana The Greatest Night In Game & Instant Win Game – Win a Home Theater & more! Win a Home Theater & more! ENTER SWEEPSTAKES HERE – Popcorn, Indiana Sweepstakes page. ENTRY LIMIT – Limit one entry per person, per day. ELIGIBILITY – GAME ENTRANTS AND PRIZE RECIPIENTS MUST BE BOTH (A) LEGAL RESIDENTS OF THE FIFTY (50) UNITED STATES OR THE DISTRICT OF COLUMBIA AND (B) 18 YEARS OF AGE OR OLDER AT THE TIME OF ENTRY TO BE ELIGIBLE. SWEEPSTAKES ENTRY PERIOD – The Game will start at 10:00:00 AM Eastern Time (“ET”) on March 20, 2018 and will end at 11:59:59 PM ET on April 18, 2018. PRIZES – THIRTY (30) FIRST PRIZES: Each First Prize consisting of one (1) DVD version of the motion picture “The Greatest Showman”; First Prize ARV: $20; ONE THOUSAND, FIVE HUNDRED SECOND (1,500) PRIZES SECOND PRIZES: One thousand five hundred (1,500) Winners will each receive one (1) bag of Popcorn Indiana (4.4 oz net weight) designated by Sponsor and ARV: of each Instant Win Prize: $3.79. Total ARV of all Instant Win Prizes: $6,285.